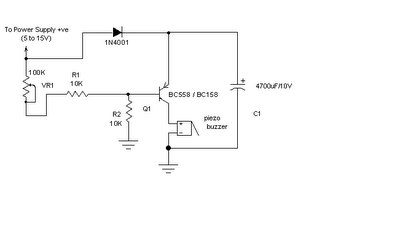 Most of the circuit power supply failure alarm circuits require additional or external power supply. However, this circuit requires no additional power supply. The circuit uses a voltage of 5 volts to 15 volts. To adjust the voltage of this circuit, first connect the power source (5 to 15V) and change the position of potentiometer VR1 until the buzzer buzzer On to Off position.